Discussion in 'Luthier's Guitar & Bass Technical Discussion' started by pinefd, Jun 3, 2008. Correction!! the aluminium top in my Gemini duplicator is 3/8"
The side dot and top dot drill plate is one of those items that one always puts off until you use it! We use a electric drill for the side dots and the drill press with a .250 drill for the top dots. The side dots are made from PVC welding rod white or black and require a number drill bushing as well as drill bit. Thanks Semore!! The blue one was for $2,200.00, but I don't do anymore those models, I just have it there for record, I can make the same concept with my new bolt on model (as the rosewood & cooper candy) with my headstock & body shape, I have more models coming up in bolt on & set neck, the "Guitar Zone" web site is about the shop and services (repairs, custom works etc), the Navarro Guitars web page is under construction and soon you can check my new models! I like your headstock shape, Navarro! Very cool. Interesting. We do our side dots the exact same way using the same PVC material (when it's not pearl). You jig looks a lot nicer than ours though. I am pretty new to building guitars I've built a few and starting to sell some. This thread has given me lots of ideas. Now if I could just figure out how to build Saul's neck shaping jig. 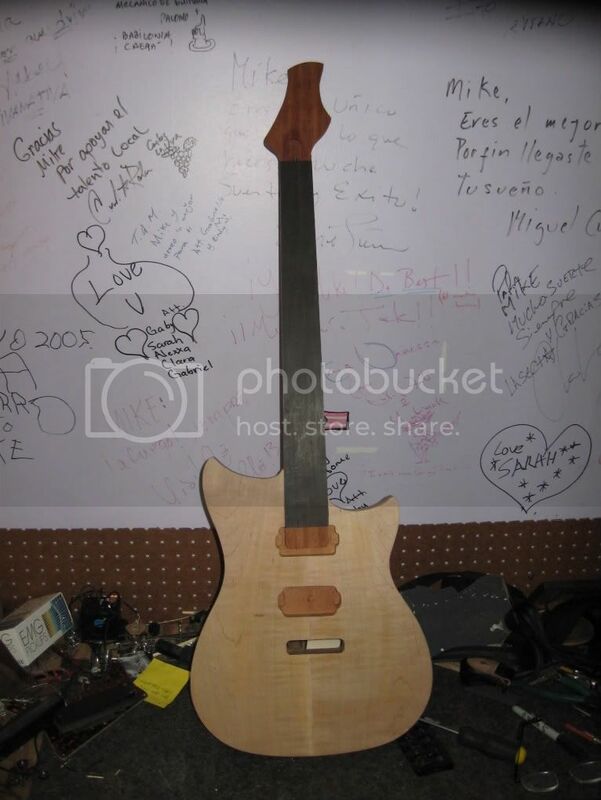 Guitar Builder, I think Saul will help you if you send him a personal email, I think all of us here has the same intention to help the new builders, just send him a mail! My favorite thread needs a bump. Here is an easy one for those that use fretwire that comes in a large roll.Finding the end quickly can be a pain, so I use wire nuts screwed onto the ends to make it easier. Basically a same idea as last time with some changes. 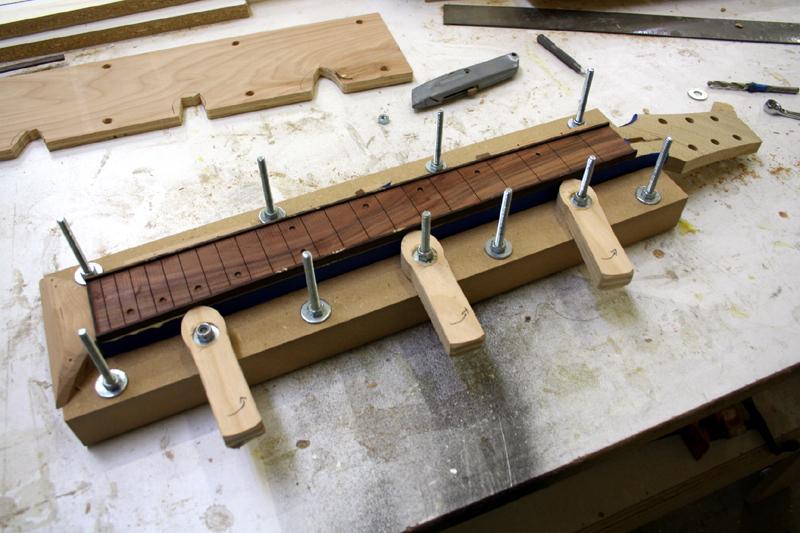 Once side has fixed blocks that will come up to just below fretboard height. 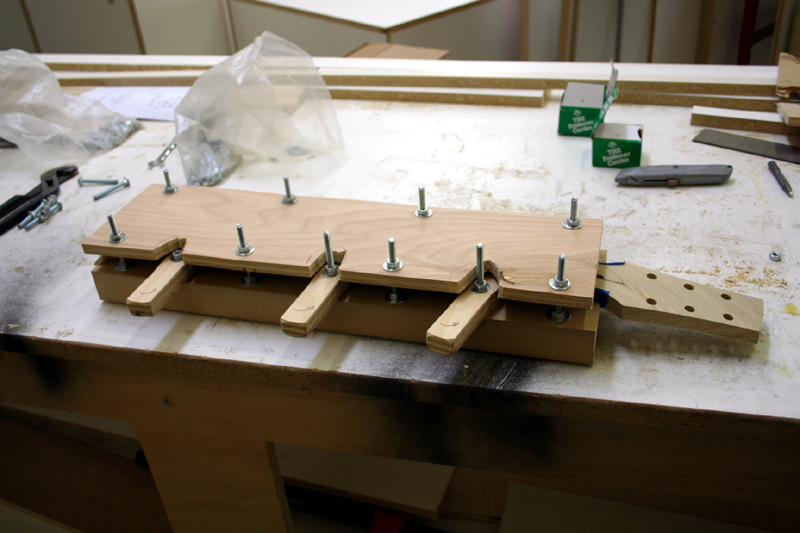 The other side has cammed clamps that rotate and pinch everything into place. Simple clamping caul, this time its just 1/2" plywood. The last ones were 3/4" and radiused to match but honestly the 1/2" ply bends just about right on its own. 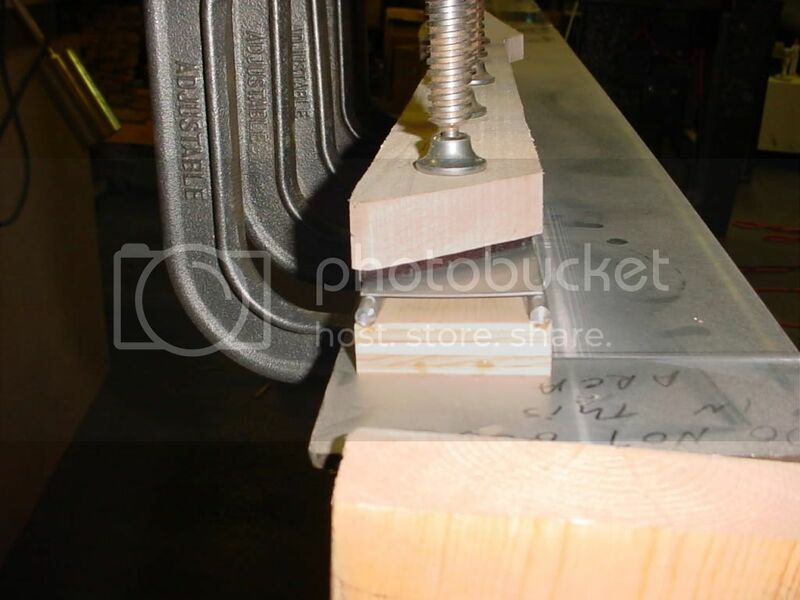 edit: its not in the pictures but I have a couple guide pieces that go on top the board under the clamping board to apply pressure evenly everywhere. I am so glad this thread has been bumped back to the top. Thanks to Frank Pine for starting it and all the folks contributing to it! There's alot of cool jigs in here. Does anyone else use CNCs to build? That's what I use. I've got a few things that I use, but nothing terribly tricky. Although this is not really a jig. I just finished (ran the first test piece like an hour ago) my Fret slotting saw. 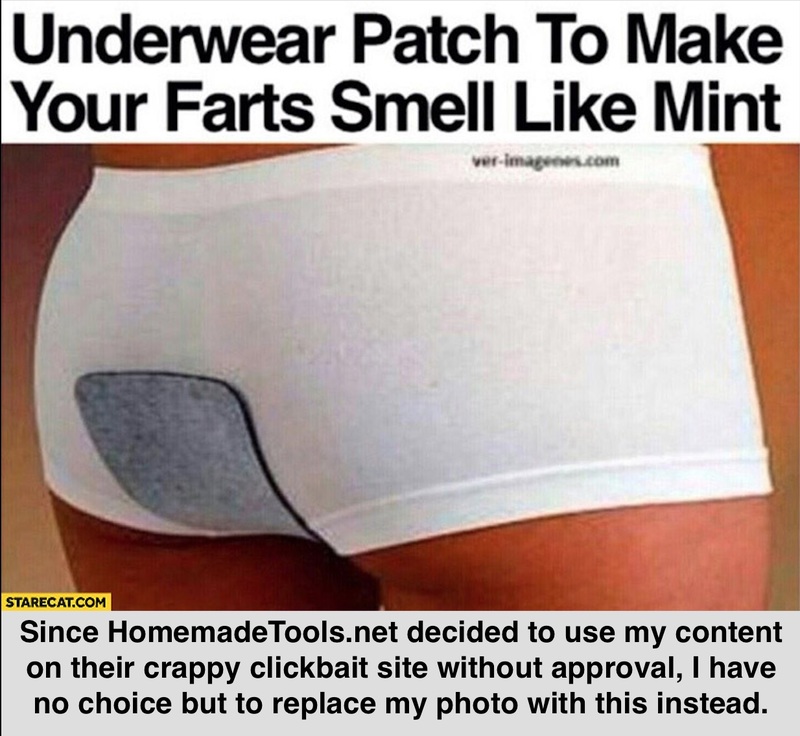 works like a charm. powers through ebony like butter. Still have a few safety guards to make for it now. Our shop has really been comeing along now for the last year and a half and we are just about to hit it hard. Really cool stuff so far here guys. I definitely got some ideas from this thread so I too will share. 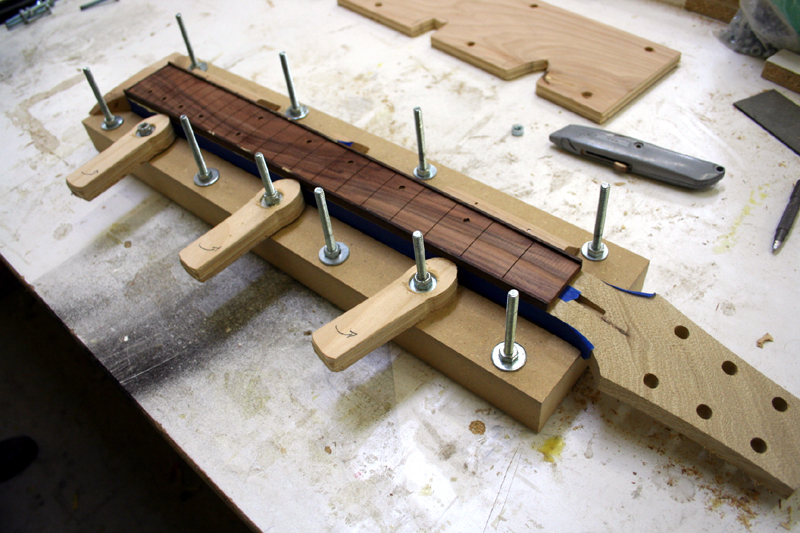 Below is my fretboard station. 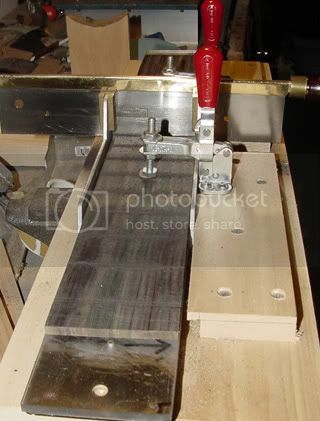 I radius my fretboards before they meet the neck, so they get slotted and bound, then carpet taped to pieces of plexiglas that index into a multi-use sled/jig where inlay and radiusing takes place. This is an inlay router I made for repeatable and accurate inlay work. The key is the stainless steel collet that rides the template to cut the pearl(or other material) which is glued to a sacrificial piece of wood. In the photo is my standard diamond pattern template. I have also made templates for block and trapezoid patterns and more will come as requested. Here is a close up of the router. The little brass donut on the bench is a secondary collet that slips over the primary collet and offsets the cut by the thickness of the cutter, allowing me to cut the inlay pockets with the same template. I made 20 of these secondary collets in .001" increments to allow for different cutter widths and varying machine runout due to differing wood densities and such. With this analog machine I get cnc results. After cleaning out the corners with a tiny chisel the inlays snap fit in the pockets with just a little finger pressure. I love this thing. Also note the vacuum port holes. 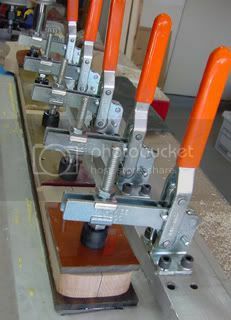 They are actually quite effective in extracting the dust and they also create some serious grab on the template which makes the operation very smooth. There is also a very low power air pump pushing air through the collet, keeping the collet dust free and cooling the bit off as well. The first one of these that I made did not have the air pump feature and the collet got clogged with gooey rosewood dust in about 6 seconds and melted the plexi. Boo. No problems since the blower feature though. 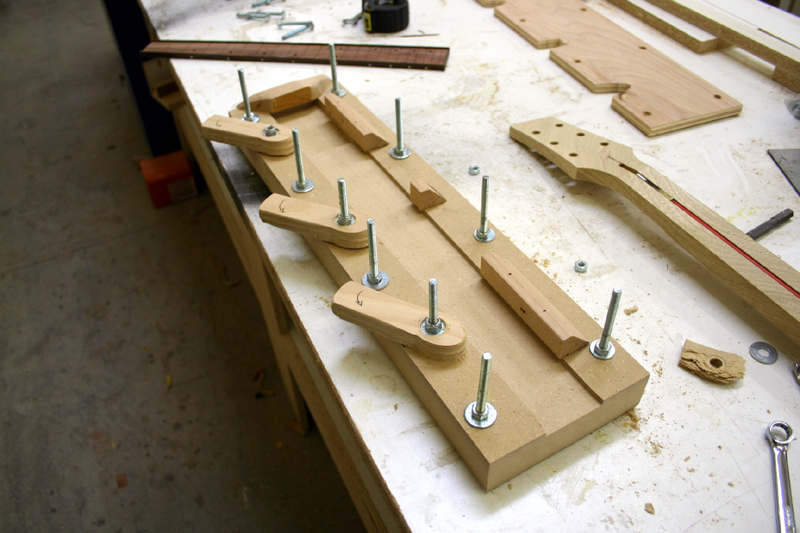 This is the radius jig. 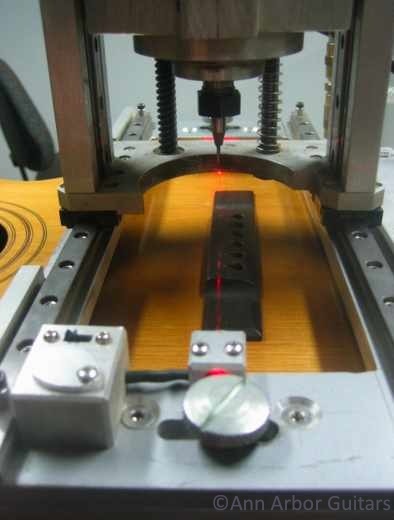 The radiused router rails ride on the steel rods of the carriage to traverse the width of the fretboard while the carriage itself slides up and down the length of the fretboard. I use a sharp 1/4" spiral carbide bit and it cuts a clean consistent radius(inlays and all) to within .002". Clean up starts with 400 grit and your off to the races. This is my favorite shop fixture. It is a 1960's hydraulic dentist's chair base. It has 16" of travel and 360 degree rotation. I outfitted it with a 90 degree tilt base and the jigs and fixtures can spin on that. With this thing I can get any part of a guitar anywhere I want it. 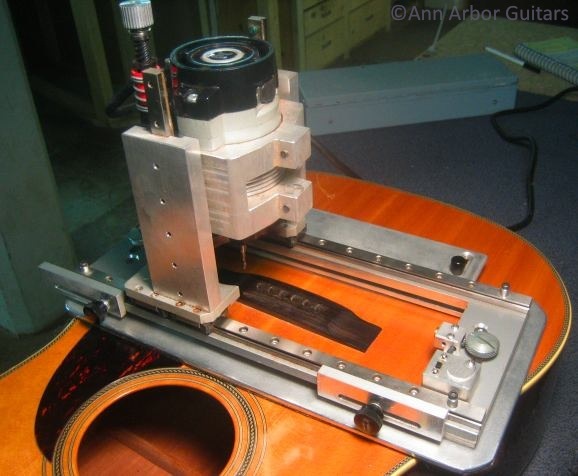 I'm using a CNC to make guitars and should be releasing the first few soon. 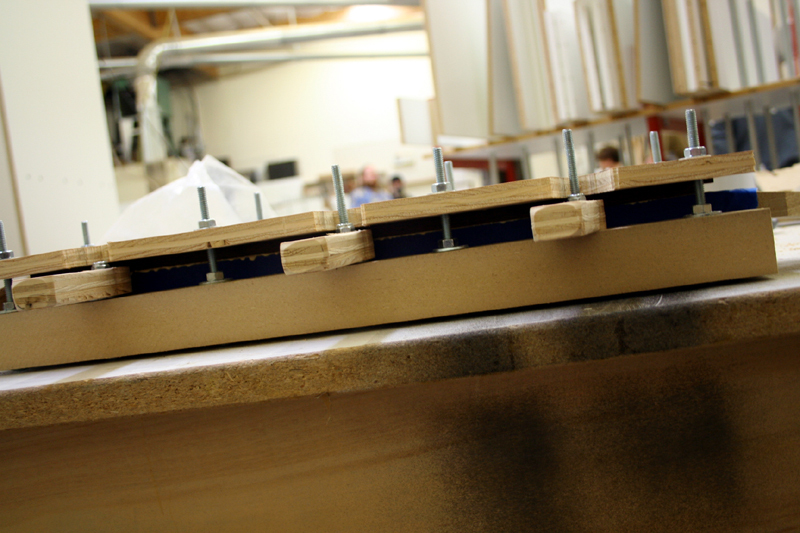 Below is the body jig I use to hold the bodies to the CNC. There are 4 1/4" locating pins I drill locating holes in the body blank. The pins allow me to flip the board over and cut from the opposite side. I can drill T style bridge holes from both sides of a blank and they match up perfectly. Below is the body jig with a T style 1/2" ash top I cut out. Note the "tabs" left in the body to hold it to the blank. Of course there are jigs for the non CNC cuts like the electrosocket, headstock trussrod hole, and side marker jigs. 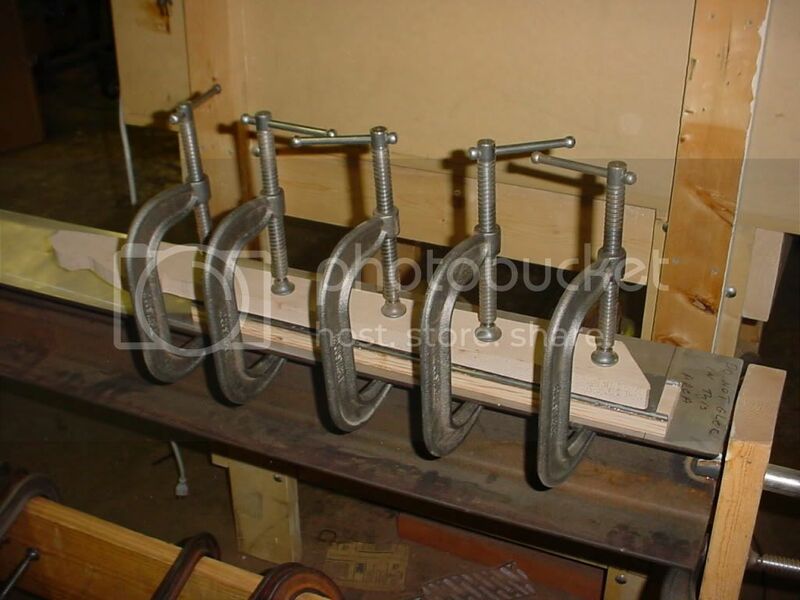 These jigs were made using the CNC. ...This is my favorite shop fixture. It is a 1960's hydraulic dentist's chair base. It has 16" of travel and 360 degree rotation. I outfitted it with a 90 degree tilt base and the jigs and fixtures can spin on that. With this thing I can get any part of a guitar anywhere I want it. Though I spent a few years building a hundred or so guitars and teaching/supervising the builds of almost as many, I've since returned to my main passion of repair and restoration work. So I don't have many tools and jigs around the shop that cross over to building, but figured "why not?" - it's a cool thread and I'll post something anyway. Lot's of nice tools and cool ideas so far. Here's one tool that though I use for repair work may also cross over to building. I've had so many jigs for routing saddle slots, from StewMac, LMII, and a few styles I've made, and always found shortcomings in each. So I figured I might as well spend the time and make one that will actually meet all my needs for the rest of my career and be done with it. A few main points to start the design. First, a good laminate trimmer (no more damn Dremels, sloppy bearings, or 1/8" shanks). Second, ability to plunge smoothly while cutting. 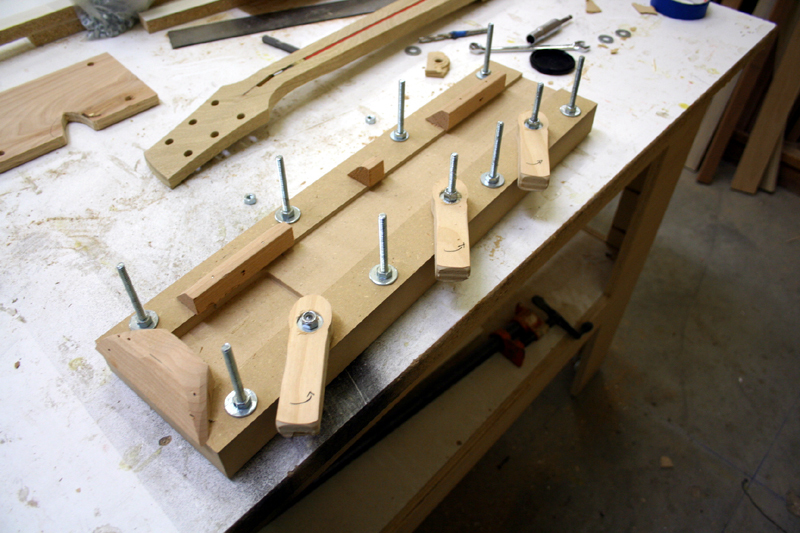 Third, a base which secures to the instrument, and an adjustable carriage that can be quickly and easily fine tuned. Here's what I came up with. Built around a Porter Cable 310 lam trimmer (damn Black and Decker for taking over Porter Cable and discontinuing the 310 - best laminate trimmer ever made ). It's pretty much all cut from 6061 aluminum. The base vacuum clamps to the top, then the carriage can be loosened and adjusted to set the angle and position of the saddle line. 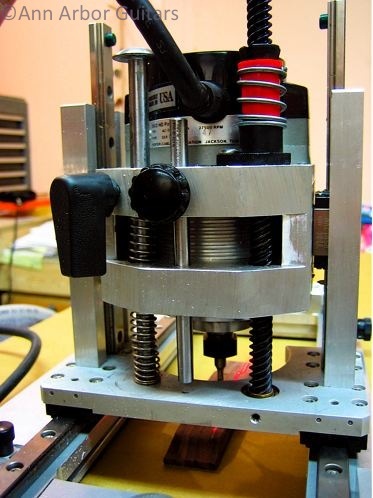 Then it plunges and slides on THK linear bearings. I was able to set it up and zero it out quite nicely with a laser guide for setting the saddle line on new bridges. From the back you can see the spring balance and lock on the left, and easily set depth stop in the center, then a lead screw on the right for a smooth plunge. Then on the other side is a width stop for making second cuts for odd saddle widths. This way if I'm trying to deepen a .110 slot, I can cut one side with a 3/32" bit, set the stop .016" over, and be guaranteed parallel sides at any odd width. Now what was always such a pain to set up and execute cleanly, is an absolute breeze. If I have trouble with even response from a saddle transducer and fitting and leveling the saddle doesn't fix it, now it's no problem. 5-10 minutes to pull out, set up, and cut, and I can level out the bottom of the slot or smooth out ridges on the sides, and not have to worry about widening the slot a thousandth. And routing slots on new bridges, I don't have to worry about chatter on the side walls from dremels or unreliable guides, or getting a clean plunge and not creating steps on consecutive passes. 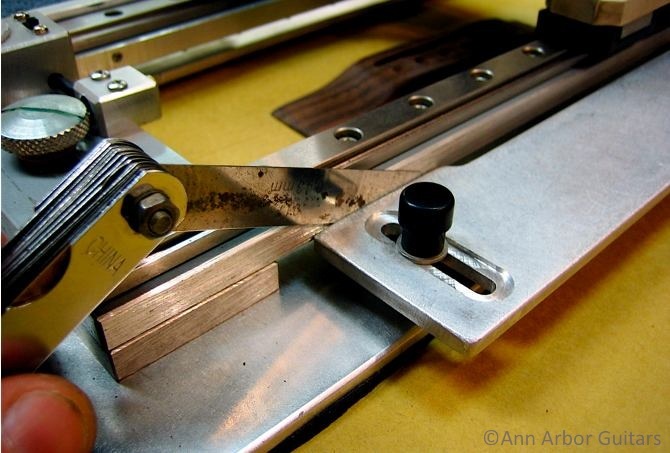 I have lots of other interesting tools, jigs, and fixtures, but the focus is more on repair. Maybe in another thread some time I'll pull some of those out. Thanks for all the insight gentlemen. Don't know if this qualifies as a jig. but it's something i borrowed from the Tobias shop. 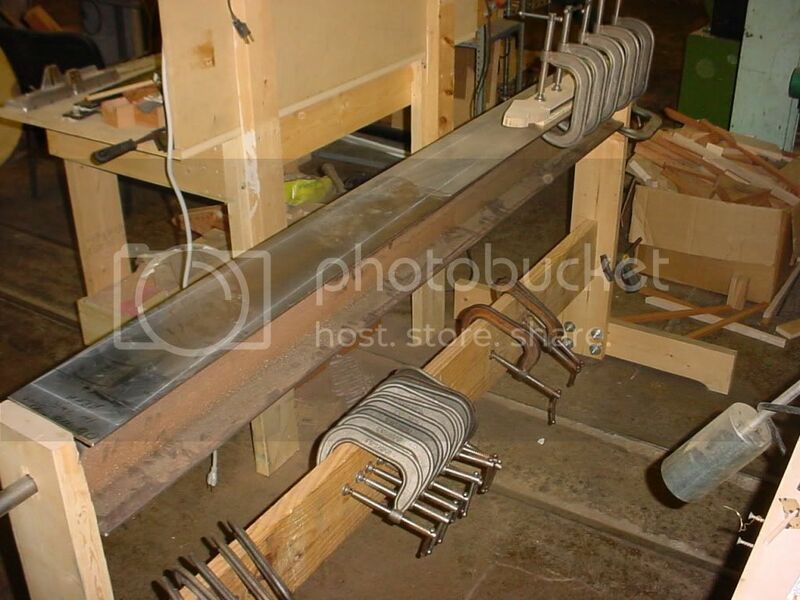 It a 7' long I-beam thats been milled flat on both sides and is used as a glue up rig for Fingerboards. 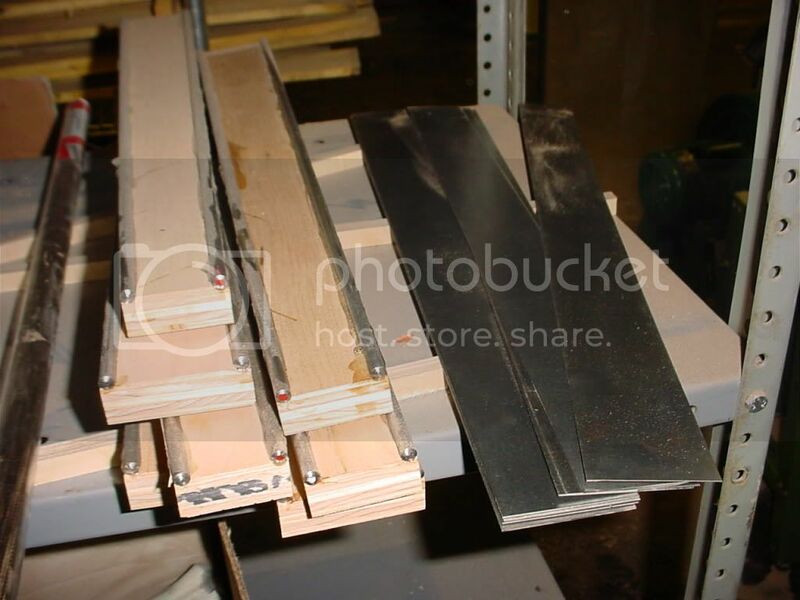 I can glue 3 necks per edge for a total of 12 when useing both sides. the beam is mounted on a stand that allows it to rotate so that both sides are useable. and all the clamps are stored on the stretcher between the stands. 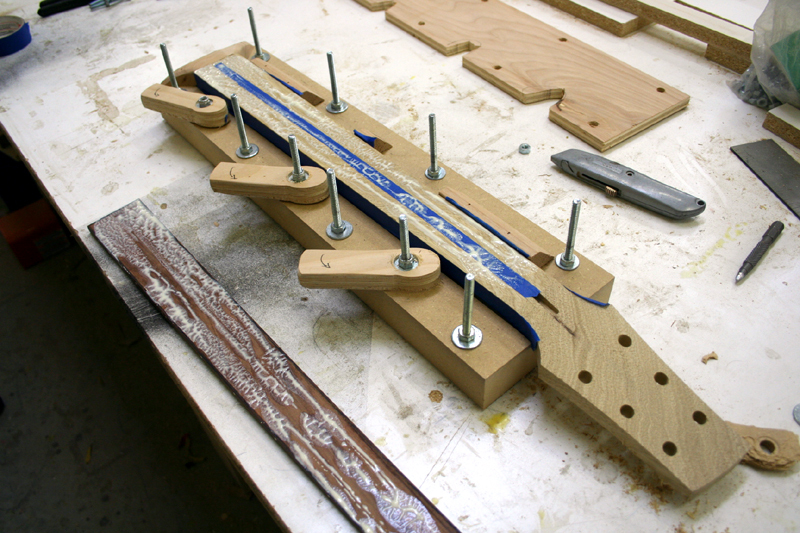 We radius our fingerboards before glueup and that requires a special glueing caul made from two 1/4" rods and a flexible steel shim that curves to conform to the radius of the board. the last photo is how it looks during the glueup.